Disney World has updated its park hours for November and early December. Why is that important? Because that means that more Fastpasses are now available for many days and many parks. If a park added hours, you’ll find that it also added Fastpasses for that time frame. You can find the updated hours on my Crowd Calendars. If you’re looking for the November park hours, you’ll find them on my November Disney World Crowd Calendar. 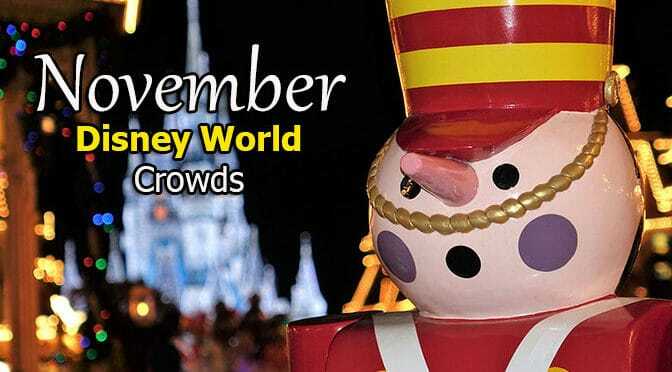 If you’re looking for the early December park hours, you’ll find them on my December Disney World Crowd Calendar. If you know someone travelling to Walt Disney World during this time frame, use the sharing buttons below to let them know that park hours have been updated. November 30 is the day MK is having its employee Christmas celebration and the park is closing early for that. Why does MK close are 4:30pm on Thursday 11/30? Actually, looks like AK is staying open an hour later, but not seeing changes at MK except for AM EMH added on Saturday. I’m guessing they will eventually add some 8:00 AM park openings? My dates don’t seem to have any changes 12/17-12/23. Do you think those hours will be updated in the future? Yes. Changes affected early December.